Just picked up my car from the shop. It was routine service, though I had told them to replace my brakes because I have almost 50,000 miles on the car and I’m sure it’s time. I don’t like to wait just because I might be able to get a few more months on them since I often have trouble finding time to bring my car in. I’d rather get it out of the way. Yet despite telling them I was willing to spend hundreds of dollars to replace my brakes, they still didn’t replace them. Why not? Because they insisted I have more than enough life on my brakes to make it to and even past the next service. In this particular car, I routinely use the down-shifting capability, so I guess I’ve successfully stretched the life of my brakes far longer than I have before. What’s the point? The point is that the auto dealer has earned my trust (not the first time). Even though I’d given them permission to take more of my money, they didn’t. I assumed my brakes would be worn and they knew that. They also know with so many miles on the car, and a customer that believes it’s time to replace the brakes, that they’d never be questioned if they replaced them unnecessarily. They still didn’t. That breeds trust. In medicine, we often hear that things are too complicated for patients to really judge for themselves. But that misses the point. Right now we don’t have a system we can trust in healthcare. While there are many healthcare providers I do trust—my own doctor, our pediatrician, our dentist and our kids’ dentist—there are many more that we don’t. And even when it comes to the providers we trust, I still don’t trust their business practices and billing offices. They are pushed to do things unnecessarily (like taking my blood pressure or temperature before looking at a discolored toenail or referring us to other doctors in their practice group) even if they don’t believe that is truly the best course of action. Establishing a healthcare marketplace that we trust is the ultimate goal of transparent pricing. There are other steps that are necessary to accomplish this, but don’t let the healthcare industry fool you by trying to pick apart the way patients will, or will not, use the information they are given. The healthcare lobby would certainly like to convince policymakers that patients won’t really use pricing information, because “it is confusing” or because “healthcare is different.” It is not different. 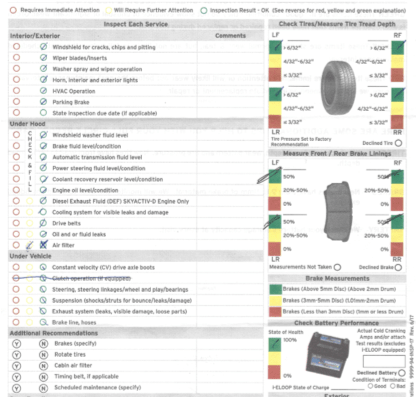 When I was picking up my car, in addition to an itemized bill (something I was given without having to request it), I also received a copy of the mechanics’ checklist with more than 25 things that they checked on my car and measurements of my brakes and my tire tread. I didn’t have to ask for this, either, and I can tell you that many drivers don’t know what HVAC stands for, when their drive belt should be replaced, or what struts are. It doesn’t seem to confuse them. When we trust that a market works, we don’t have to scrutinize the price of each and every thing we buy. We have to spot check. We have to have confidence that a small percentage of others have checked. We want to know that consumer websites or the media would call out abuses. We Americans want a healthcare system we can trust—one in which preventive medical care is as simple as preventive auto care, in which care for an injury is just like care for a banged-up car. It is more than possible—it is essential. Healthcare is only different because we allow it to be. We let an entrenched industry that is profiting from that myth continue to obscure information, to drive prices far higher than they should be, to generate profits that border on obscene, and to engage in the financial abuse of the least fortunate among us.